An unofficial memorial to a Welsh village drowned to make way for a reservoir has been painted over. The wall daubed "Cofiwch Dryweryn" - Remember Tryweryn - now reads "Elvis". The original graffiti appeared near Aberystwyth, after the village of Capel Celyn in Gwynedd was flooded in 1965. The reservoir sparked widespread protests in Wales and is widely seen as igniting the Welsh nationalist and language movement. The wall on the main road from Aberystwyth to Llanrhystud has been defaced several times in the past. Morys Gruffydd, who snapped the shots of the latest daubing, said he was disappointed by actions of those responsible. "It's a pity, because the wall is quite iconic," said Mr Gruffydd. "I imagine it has been done by someone who doesn't know the significance of the original graffiti." There have been attempts in the past to have the wall legally protected, however officials have said it does not qualify as a listed building. However, Mr Gruffydd said he would not be surprised if the old slogan reappeared. "What usually happens is someone appears with a can of paint, whenever it damaged or needs touching up - I'm sure it will be back before long." 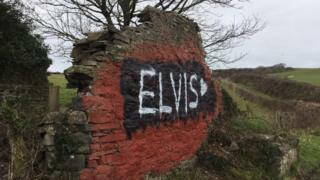 The choice of the word Elvis may be significant, as it mirrors famous graffiti 15 miles east of Aberystwyth, which has become known internationally as Elvis Rock. The Plaid Cymru assembly member Bethan Sayed said the Cofiwch wall should be offered protection - just like the latest Banksy artwork in Port Talbot. "I'm very disappointed. The Welsh Government needs to protect this, the same as they have had an input into the future of the Banksy in Port Talbot," she said.